why i was never an obit writer. a photo essay. Bernell “Doc” Smith was born on the family farm in Mereta (I have no idea where he was actually born?) to Oscar and Lillian Smith. He was your average farm kid, sharing adventures with his brother and their dog Tuffy, a mutt with a face scarred by too many curious peeks into rattlesnake dens. As a kid he had a pair of overalls that would routinely end up on a barbed-wire fence while he ran around the farm naked. A hippie before being a hippie was cool. Yes, this news was embargoed till after he passed away. He attended a little school a couple of miles down the road from the farm. One day his mom asked Dad’s grandfather if he would pick Dad and his brother up from school. He agreed. Upon arriving at school, he told the teacher he was there to pick up his grandkids. What are their names, she asked. He froze. Their real names were long and complicated. He couldn’t remember them, so she refused to turn the kids over. He went home with no grandsons. Soon afterward, he decided the boys would go by the names “Doc” and “Dutch” because they were easier to remember. And from that day on, he was “Doc.” He didn’t say if his granddad ever tried to pick them up at school again. I’m betting no. As a young man, he loved baseball, playing for Al’s Chicken Hutt, the (and that other team with the tractor jockey name?) and the Central High Bobcats. He played catcher, and was the proud owner of the world’s coolest catcher’s mitt. He tried to turn his No. 2 son into a catcher as well, but sadly the son was left handed, causing him to hit an alarming percentage of right-handed hitters in the head when throwing the ball back to the mound. Apparently this is frowned upon in Little League. It was the first in a long series of disappointments. Doc joined the Army and found himself in Japan guarding against North Korea (is japan right? not sure). They had no prickly pear and mesquite trees, so after a year he came back home. Besides, how long could that North Korea thing possibly last? He eventually traded in his farm tractor to go to work for San Angelo College in its early years. His first office was under a tree when it was San Angelo College, and he helped it become Angelo State College and later, Angelo State University. He served as physical plant director for many years. If you walk around the ASU campus, you’ll see his labor of love everywhere. He was an incredible carpenter, a genius mechanic, a botanical wizard, and he made a pretty spectacular Sunday morning pancake. What more could you ask for? Syrup, maybe. After retirement, he enjoyed camping and traveling. He loved going to NASCAR races (suspiciously claiming the Labonte boys, Jimmie Johnson, Jeff Gordon and Dale Jr. were his favorites, effectively claiming most of the NASCAR field) and watching his favorite baseball teams, the San Angelo Colts and Texas Rangers. He and son Mike and daughter-in-law Laura attended several Rangers games, which may or may not have led to their increasing success. And he had some fine adventures. He and sons Rick and Gary spent a week exploring the Grand Canyon. He still holds the canyon record for most pairs of boxer shorts (seven. SEVEN!!!!) packed into a national park. They had much fun except for his unfortunate choices in freeze-dried pudding. That was some bad pudding. And the Great Rocky Mountain Tandem Bicycle Fiasco will someday be made into a folk song. A pizza and a beer while watching the Dallas Cowboys in a snowstorm? That’s living. He lived. He dearly loved Texas. Lived there his whole life. Assuming heaven is Texas, he’s still there. I hope they get the Rangers network. He ate a lot of Blue Bell. 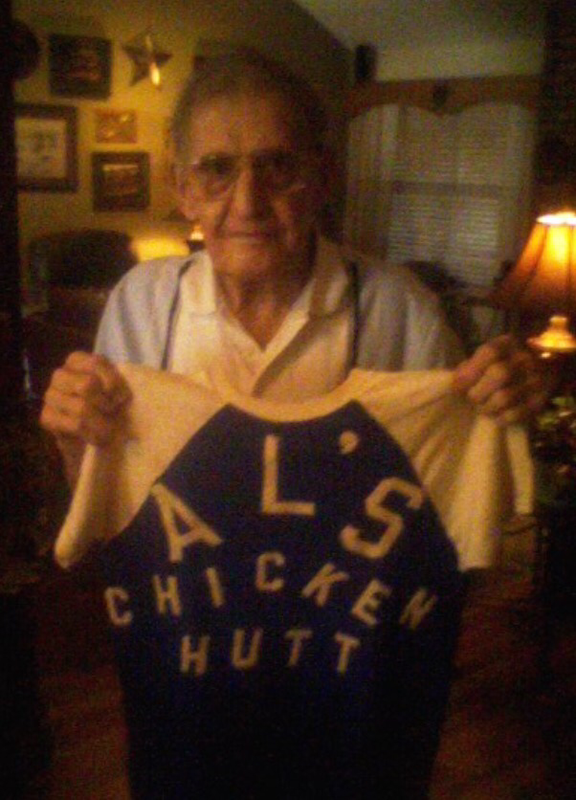 And six decades later, he still had his Al’s Chicken Hutt uniform. 4 Responses to why i was never an obit writer. a photo essay. I think this is a beautiful obit. I’m so sorry, Gary. Aww Gary, I’m so sorry for your loss. I’m thinking of, and praying for you, Mo, Rick and the family.